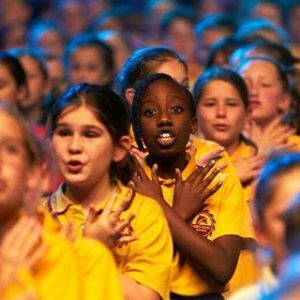 One Big Voice is Australia’s largest children’s choir, open to all primary schools, public or private (Years 3-6). Students who can’t get enough of singing are invited to join our OBV Singers who meet weekly on Tuesdays and perform together at One Big Voice in August. This is available for all students aged 9-16 years, whether their school is in One Big Voice or not. See OBV Singers Tab for details. Students participate in a non-competitive massed choir, building musical confidence in teachers and bringing the pure joy of singing and music to their students. The magic of thousands of children singing in harmony must be experienced to be believed. The magic of thousands of children singing in harmony has to be experienced to be believed.